This lightweight and foldable electric scooter is right for everyone who needs a compact and ultra portable scooter to take on the train, up the stairs, or just to store away at home. With only 22 pounds, its 36V 300W motor will reach a top speed of 20 mph. The 7.8Ah battery promises a range of up to 15 miles. Its front and rear suspension is essential for riding comfort for a scooter with 6" wheels. Use the integrated USB port for charging your phone on the go. Reinvent your style of transportation - the sleek looking Mosquito will speed up your ride to work or class and make your life a little bit more fun. Guaranteed! Recommended for riders 6' tall and below. Distance of footboard to handlebar is 34 inches. Compact , Sleek & almost complete .. This is Mosquito is not pesky.. & will be a joy to have around. I’d like to say thanks to Peter for all the assists. you are approachable & response when needed. Pros: The Mosquito, although 22 pounds, is very sturdy, feels durable & well built. When I got it out the box, I was surprised to see those 6 inch wheels are NOT as little as I thought they would be, they are actually big & thick. 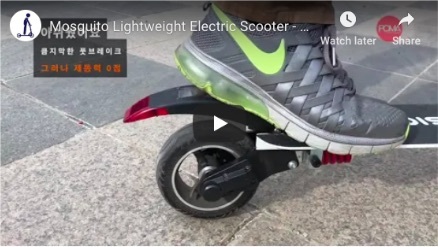 The Small tire scooters (like a Razer I had many moons ago), catch every pot hole or crack in the road & can send you on unscheduled flight (lol). Bigger wheels provide way more comfort & safety. The deck is slim, & but even slim, it feels like its never going to be a problem. Overall the scooter gives a lot of bang for its price, & I’m happy with it. I’m almost 6 ft tall, a little over 200 pounds, & still I get very good speed. Although going uphill, the torque didn’t do much. I had to get off & push. Cons: The only thing I consider a Con… is the “Touch Control Plate” that is below the handle bars, on the back of the Stand (used to turn the scooter on & off, control the front light, & switch gears). I find it to be a kooky cumbersome, unreliable, pain in the A#$. It requires too much fiddling around, for something that you need immediate response from. There are 2 buttons that are TOO close to each other. 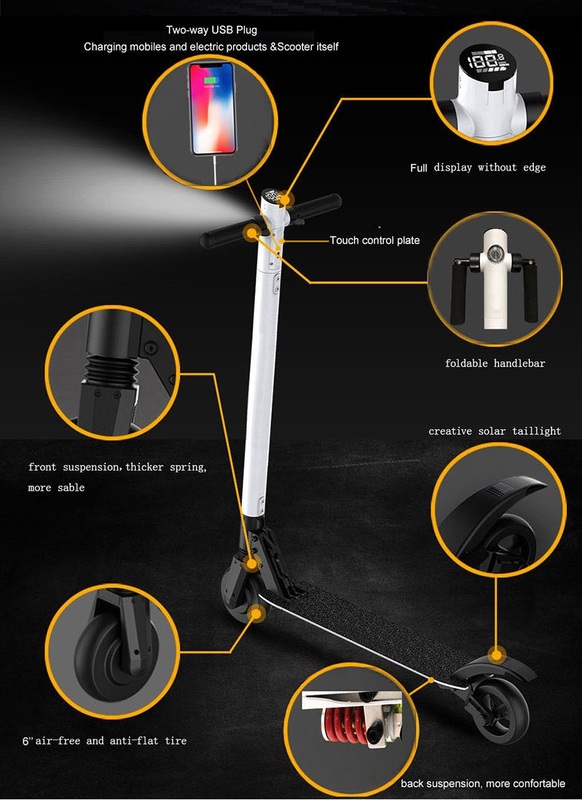 One is to turn on the scooter’s light (would prefer a button that pushes in & out, or a flip switch). To get a better option, you really need to download their app, & use your phone (the app is way more responsive). 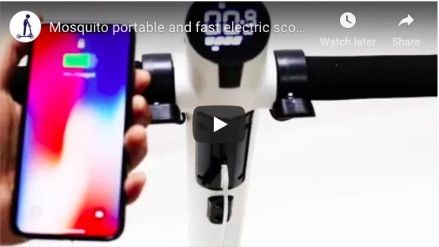 To use the app while riding, I needed to buy a phone holder for the handle bars. Can't wait to receive this product. I spent so many hours looking around for something that will go 20mph, more than 10 mile range and under 500 bucks. If this delivers as expected i will direct further business. This machine is solid....Built for convenience and durability....I am currently dealing with rectifying an issue, thus not on the road yet. I will post another review. 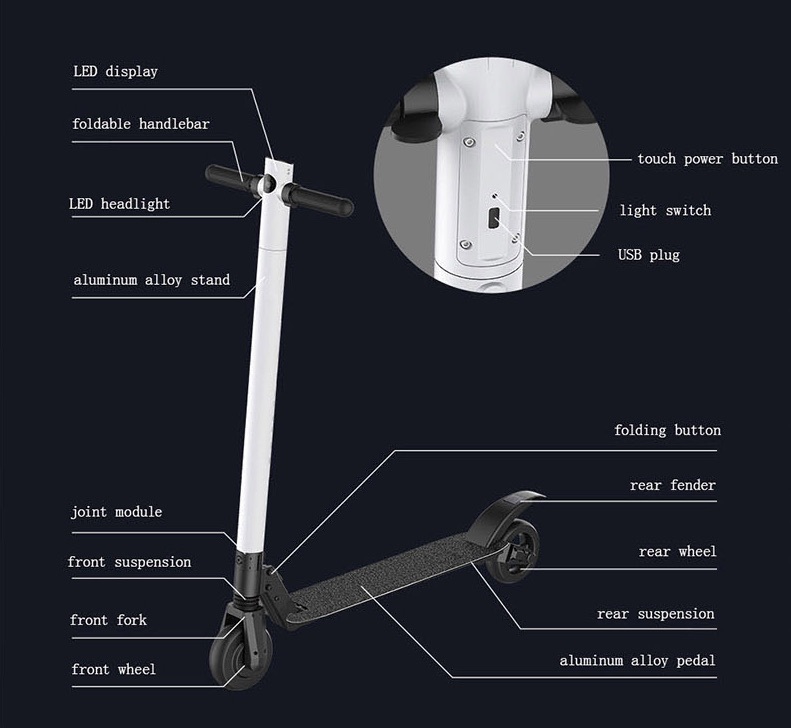 These features make our lightweight electric scooter the perfect choice for riders wanting an ultra portable, fast, and sleekly designed vehicle. Stay tuned - we will upload our own footage soon!